Welcome to the Little Pink House! We are so excited to tell you about Eugene Oregon and all of it's surrounding attractions. The Little Pink House is just blocks away from the University of Oregon, Matthew Knight Arena ,and the soon to be "new" Historic Hayward Field. It is also a short walk to and from Autzen Stadium and our beautiful bike paths along the Willamette River. The EMX bus can be caught three blocks from the house and it will take you to the heart of down town for the Farmer's Market, Saturday Market, Voodo Donuts (don't miss those) or just to experience Eugene. We are located in the heart of the historic Fairmount Neighborhood which offers many bakeries, restaurants, organic markets and the famed Prince Puckler's Ice Cream Parlor. The Little Pink House was built on the foundation of the coach house which belonged to one of the first estates built in Eugene. In 2006 the small dwelling burnt to the ground in three minutes and from there we designed and built the Little Pink House which became the fifth vacation rental property in Eugene in 2007! 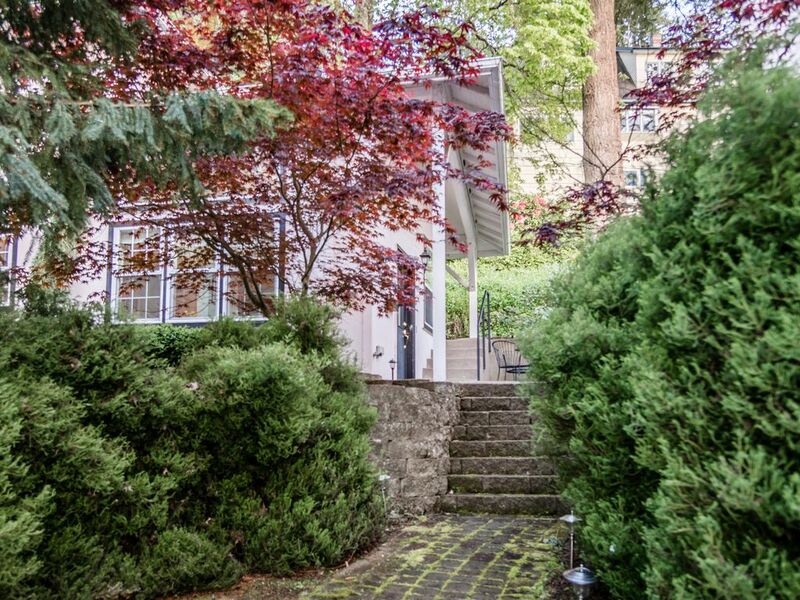 The House is tucked away on a private alley, in a wonderful wooded neighborhood only blocks from the University. The Pink House is furnished with nice beds linens and towels. The kitchen is fully furnished with pots, pans, dishes, coffee maker, microwave, dishwasher, coffee and tea. The house has a gas barbecue, surround sound, cable television, sky lights, wireless internet and comfortable furniture. We have literature in the house regarding Eugene and it's many attractions, as well as the Willamette Valley. We are close to fishing, hiking, boating, biking, wine tasting...you name it! We have coolers, fishing and fishing equipment etc. Please let us know what you may need for your Eugene adventure! We know you will enjoy our 'hide away'! We have hosted many parents of U of O students over the past eleven years- GO DUCKS! We have stayed in VRBO properties, in Greece, Italy, Australia, New Zealand, Thailand, Panama, the United States, Germany and Mexico and had absolutely wonderful experiences in every property. We want to provide that for our guests as well. We have recently used The Little Pink House as a long time rental for visitors to the University of Oregon as we are only blocks from campus. The Little Pink House was brand new in 2008. Given it's location to the University of Oregon, we decided to list the home on VRBO. Having traveled the world and staying in VRBO properties ourself, we thought it would be a wonderful way to preserve the house, and meet wonderful people. When we listed the Little Pink House it was one of five VRBO properties in Eugene! We are now nearly word of mouth having visitors return time and time again. We love the fact that so many have loved staying at our Little Pink House. The Little Pink house is blocks away from the Matthew Knight arena, Hayward Field and even Autzen Stadium. It is set off of the street, yet only steps from Historic Fairmount Blvd. Around the corner Hendrick's park with acres of old growth forest, running and hiking trails. Pre's rock is found only blocks from the house. Fairmount Park down the street is perfect for the kiddos and boasts a water feature for summer fun. Our famous bike trails are only blocks from the house as well as the Willamette River. Spencer's Butte and Mt. Pisgah are also only a short drive away. Catch the EMX just blocks away for a short trip into the center of Eugene. Newly installed ductless heat pump. We now have air conditioning as well! Ductless energy efficient heat and cooling! Large kitchen fully equipped. If we don't have it....we will get it for you! Brand new high definition 42 inch flat screen television. Some books in the house. In the summer and spring you are close enough to hear the U of O marching band practice. We can hear all U of O events. Came to Eugene for a few days to visit the University of Oregon with my daughters. We absolutely loved the place. Very clear and had everything we needed. Very close to the U of O and downtown area. Would definitely come back and recommend to families. This little house is perfectly situated blocks from campus, clean and well appointed. This is our second stay and will most likely book again! We had a wonderful stay at this Eugene cottage. It was well stocked with very good beds. Everything was comfortable. We were troubled with a bright light shining into our bedroom blinds at night time which affected our sleep but that seems it would be easy to correct with curtains. The host was very accommodating to our arrival time. We appreciated how nice a place this was. Really well kept and modern small home. All the trimmings. Would be well suited to a family with small children. The bathroom’s location is a bit odd but doesn’t take from the overall experience. Would rent again easily. Thanks. The LPH was originally the carriage house for a larger home. Somewhere along the line it was converted to a tiny house. In 2007 the now converted house burned to the ground (in less than three minutes). We had already had plans at that point to someday build a new home on the property. We loved the historical neighborhood but neither property was “remodelable” due to age and lack of foundation. The fire was what set our plans in motion. Per land use code we could only rebuild in the original footprint of the home. Given that we desired a second story this became a challenge. It is very odd build-but quite clever really as my husband designed maximum space and light on an angular foot print! Thank you for your review. I agree it can be odd to have a bathroom away from the bedrooms. I have heard it’s kind of nice as well sometimes. We always love staying at the Little Pink House. Lara is a wonderful host and always checks in with us. The house is clean and well stocked (even with umbrellas for our outdoor sporting events.) It's also walk-able to the University, the market, and a beautiful park. Just perfect! Comfortable, quiet location near UO. The little pink house is on a quiet street near UO and a great place for our stay visiting our university student. We had a comfortable living space and kitchen to enjoy. Note the bedrooms are small (not a place to “hangout in”) and the only bathroom is downstairs from the rooms which made night time a little more difficult for my elderly parents. That said we found it very convenient and had everything we needed and appreciated the extra touches like the orchid on the kitchen table and plenty of towels for all four of us. Blocks away from our famous riverside bike paths. Hendrick's park is just behind the property which features old growth forest. Pre's trail, Hayward Field, the Matthew Knight Arena and the University of Oregon are all a very short walk. The Little Pink House has never been more than $100 per night. We don't believe in doubling or tripling our rates for "special events" such as Duck Football games. We provide a beautiful home steps from the University of Oregon at the same rate we started with in 2008. We host many parents of U of O students and pride ourselves on giving our guests an affordable experience in Eugene.